Last night R.A. Dickey threw a Quality Start (QS) and came away without a win, continuing a disturbing trend here in 2011. Both his record (5-11) and his ERA (3.72) are not indicative of how well he has pitched for most of the season. Let’s take a deeper look into Dickey’s numbers. So far this year, Dickey has thrown 16 QS and has a record of 5-6 in those games. How unusual is that? Last year I did research covering Mets pitchers for 3 ½ seasons and found that in that span the Mets had 317 QS with a 176-50 record. They get a decision in 71 percent of the team’s QS and have a winning percentage of .779 when their starter goes at least 6 IP and gives up 3 ER or fewer. Dickey is essentially where he should be in terms of decisions from his QS, as he has picked up a win or a loss in 69 percent of his QS. Where he really falls short is in winning percentage, where his .455 mark falls .324 points below average. If Dickey was perfectly average, he would have a 9-2 record (11 QS * .779 = 8.569 wins). Baseball Prospectus has a stat they call “Support Neutral Wins,” which they define as the pitcher’s expected number of wins assuming he had league-average support. Dickey has a support-neutral record of 9.7-9.2 or 10-9. Four extra wins in QS would get him to 9 W for the year. In looking at Dickey’s game logs, he could have picked up the “missing” win on 7/3, when he went allowed 1 ER in 5 IP against the Giants and got a no-decision. The other thing that stands out from the game logs is that Dickey easily could have two more losses this year. On 5/3, he allowed 6 ER in 6 IP and got a no-decision while on 6/16 he allowed 6 R (4 ER) in 4 IP and did not factor in the decision. Earlier, I mentioned that Dickey’s ERA was not truly reflective of how well he pitched most of 2011. And that’s because he was putrid for most of his first nine starts. He finally righted the ship on 5/20 but in his next start he injured his foot. That Dickey continued to right the ship while pitching at less than 100 percent is very impressive to me. In his last 18 games, Dickey has a 3.11 ERA with 25 BB and 81 Ks in 115.2 IP. That’s a 1.95 BB/9 and a 3.23 K/BB mark – both outstanding numbers. Yet he’s just 4-6 in that stretch. Many wondered if Dickey could come close to his outstanding 2010 season once batters had a full year to watch him pitch and come up with ways to attack him. In the last three months, Dickey has answered that question with an emphatic yes. His ERA in his last 18 games is just slightly higher than what it was a season ago. Dickey’s strikeout and walk numbers are both superior to what they were in 2010. 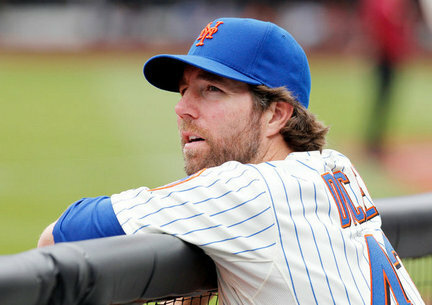 Dickey signed a two-year deal in the offseason. Mets fans should be glad that he will be on the team again in 2012. Now if they only had three more pitchers just like him, they would be all set. ← Has Terry Collins been any better than Jerry Manuel? Great analysis Brian. Can’t agree with you more.